This project seeks to provide insights into new mechanisms that could be used to enhance or inhibit neuronal signalling. The family of pentameric neurotransmitter receptors that are key components in the process of neuronal signalling and are the target of this study. It will investigate the molecular motions that occur when the receptor shifts from the resting state to the activated state in the presence of neurotransmitter. This critical to understanding the normal function of these receptors in the brain and how they can be modulated. Each pentameric neurotransmitter receptor (or ligand-gated ion channel) is comprised of five subunits that span the cell membrane. 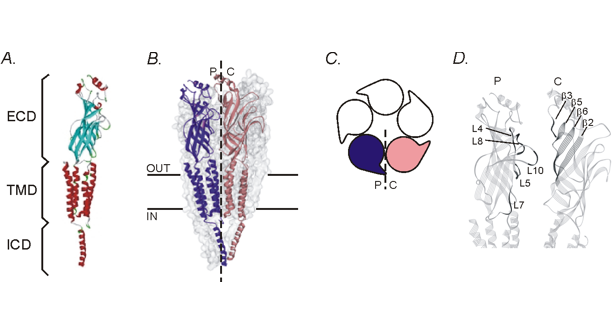 There are three distinct domains in each subunit: an extracellular domain (ECD) that contributes to the ligand binding site, the transmembrane domain (TMD) that contributes to forming the channel pore, and the intracellular domain (ICD) that has a role in traffficking and regulation of receptor function. The orthosteric ligand binding site is known to occur at the interface between two adjacent subunits, formed by the principal component (P) from one subunit and the complimentary component (C) of the adjacent subunit in the extracellular domain. While there is a reasonable understanding of what is happening at the ligand binding site, less is known about the interactions that occur at other subunit interfaces that don't form an orthosteric ligand binding site. It is the interactions that occur at these interfaces that will be investigated for the contribution they make to the activation of the receptor and the potential to form allosteric binding sites. Homology models for the human glycine receptor are used to predict molecular interactions at these interfaces, which are then tested experimentally with a combination of site-directed mutagenesis, patch-clamp recordings of ion channel function and mutant-cycle analysis.